Retrofit Kit (applicable to serial numbers JSX0003 thru JSX0018). The SubSonex Dual-Pump Air System Upgrade is now the standard for all new SubSonex kits. 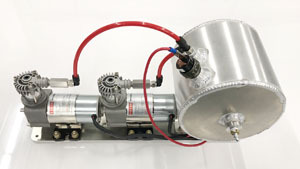 The system includes a lighter-weight aluminum air tank (vs. original steel tanks) with faster charge time and redundancy in the dual-pump system. Package bolts directly to main wing spar of the SubSonex and includes drain plug for easy access through belly skin.